Last week the world watched as Paris' Notre Dame Cathedral burned. This week East Tennesseans are watching a fire burn the Loudon County Courthouse. The county mayor says it is a significant if not total loss. The only thing we know for certain was rescued at this point is a flag. Efforts were underway to salvage what they could. Fortunately many records are microfilmed by Tennessee State Library & Archives. These same records are available in Knoxville's Calvin M. McClung Collection in the East Tennessee History Center. FamilySearch offers a handful of records in comparison to the holdings of Tennessee State Library & Archives. Many researchers know about Tennessee's county archives program. Sadly Loudon's archives is classified as partial or inactive. I don't have a photo to share because of copyright issues. This news story offers a photo at the moment, but it may be updated as the evening progresses. I hope early records are saved, but I'm thankful many records are preserved through microfilming and digitization. UPDATE: The local news reports many historic documents were recently removed because a "historic preservation society" was being established. I wonder if that means a county archives. Hopefully we'll learn more soon. Canning, Victor. Mr. Finchley Discovers His England. 1934. Reprint, Richmond, United Kingdom: Farrago, 2019. Mr. Finchley who serves as clerk for a London firm finds himself taking a 3-week vacation for the first time in years. The new manager insisted he take it. He books himself for a trip to Margate, but from the beginning of his trip things take a strange turn. Mr. Finchley finds himself in one adventure after another. Mr. Finchley is not one to be on the wrong side of the law, but he finds himself skirting it on several occasions because he is too trusting of shady characters he encounters along the way. The humor comes mostly from seeing what one considers a straight-laced person in the situations in which he finds himself. He learns quite a bit about himself along the way. The novel is not a new one. It first appeared in print in 1934. Although I enjoyed the book, I found it was one I could easily put down. I received an electronic galley in exchange for an honest review of the book. Serna, Isabel. Crazy Plant Lady. New York: Workman Publishing, 2019. 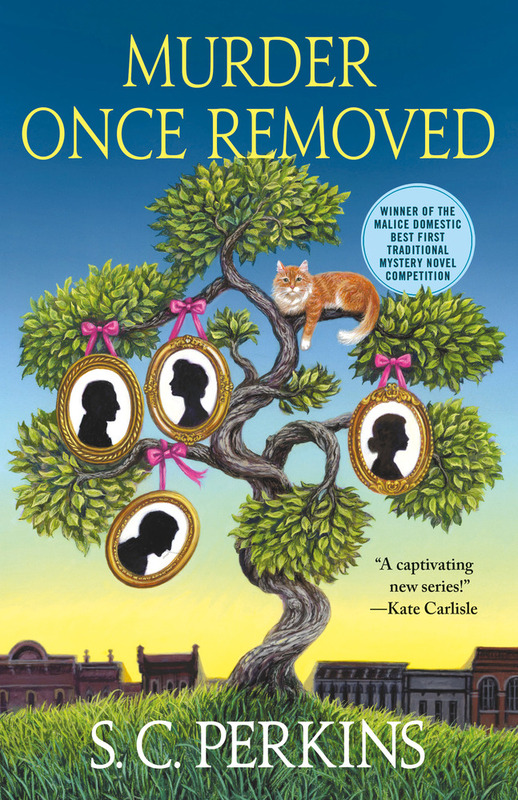 I might have enjoyed this book more if I were truly a crazy plant lady, but I'm more of a crazy cat lady, and one illustration said "Plant lady is the new cat lady," a sentiment with which I strongly disagree. The book seemed more repetitive than the cat lady volume. The illustrations are nice, and it's a gift book I'm sure plant ladies will enjoy. Workman Publishing invited me to download an electronic galley through NetGalley. NetGalley's terms expect an honest review for e-galleys received. Loonstra, Agnes and Ester Scholten. Crazy Cat Lady. New York: Workman Publishing, 2019. This is a perfect gift book for a cat-loving female like myself! The illustrations and text provide content to which we can relate. Workman Publishing invited me to download an electronic copy which was delivered through NetGalley. NetGalley's terms expect an honest review in exchange for electronic galleys. 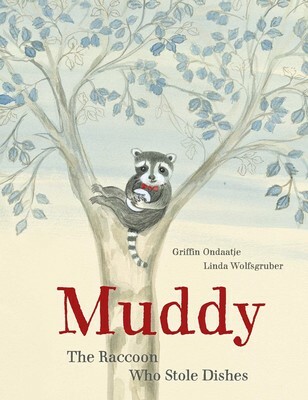 Ondaatje, Griffin and Linda Wolfsgruber. Muddy: The Raccoon Who Stole Dishes. New York: NorthSouth Books, 2019. While most of the raccoons learned it is best to leave the garbage on the other side of the river alone, Muddy braves it each night. The other raccoons fear it will get him into big trouble. One day he crosses the river, goes into the restaurant, steals a plate, and pushes it across the river, heaping the plate with others he's stolen. The other raccoons help him wash the dishes and return all the plates, clearing the restaurant in the process. This book, first published in Switzerland, offers nice illustrations, but the story may not resonate with some readers.I received an advance electronic copy from the publisher through NetGalley in exchange for an honest review. Rogers, Fred and Josie Carey. A Beautiful Day in the Neighborhood: The Poetry of Mister Rogers. Philadelphia: Quirk Books, 2019. Fans of Mister Rogers' Neighborhood will love this collection of song lyrics from the show. Fred Rogers wrote many of them, although Josie Carey contributed lyrics for several. Fred Rogers earned a degree in music composition and lent his skills to the accompanying music, which is not included in this collection focusing on the lyrics. The art work by Luke Flowers seems to fit the lyrics although the illustrations reflect the twenty-first century rather than the era of the show. For example, one illustration shows a modern flat screen computer monitor in a doctor's office. As I read the book and looked at the accompanying illustrations, I often thought, "We need Mister Rogers' influence on today's children." I received an electronic copy from the publisher through NetGalley with expectation of an honest review. Rising, Marsha Hoffman. The Family Tree Problem Solver: Tried-and-True Tactics for Tracing Elusive Ancestors. 3rd edition. Cincinnati: Family Tree Books, 2019. This review applies to the 3rd edition (2019) of the book. Marsha Hoffman Rising's [The Family Tree Problem Solver] inspired many genealogists to move beyond basic ancestral searches to more meaningful research which meets the genealogical proof standard. Marsha died in 2010, so I was curious why a third edition bearing her name alone was being released. Although it is obvious someone edited the original work to include website addresses and even information about the FamilySearch Wiki and other resources which did not exist during Marsha's lifetime, no one takes credit for these revisions. A chapter about "tree hints" was added by Sunny Morton, a well-known popular press genealogical author, and a chapter on using DNA was written by Diahan Southard, a well-regarded genealogical DNA lecturer. Neither of these chapters lives up to the standards the original author set, weakening the overall book. While care was taken to include web addresses and resources, references to Everton's Genealogical Helper and to the censuses on CD-ROM illustrate a problem in the new edition's editing. Everton's Genealogical Helper suspended operations years ago. While a person might find a clue about someone who researched an individual or family in the past, the contact information, if the query submitter remains alive, may be dated. While a few of us still own some of those CD-ROMs, very few use them. Ancestry, FamilySearch, and other online databases provide the access we need to the censuses. The book needed to be edited more thoroughly, and someone needed to take credit for their editing and revision role with an added author. The chapter on "tree hints" just does not fit the nature of the book. It is too basic of a topic. It remains at the "search" level described by Rising rather than the "research" one. While I appreciated Diahan Southard's comments when she talked about researching specific families, the chapter did not adequately demonstrate using DNA as evidence. Also missing from the chapter was a bibliography of published case studies demonstrating how to use DNA, which Rising would have provided if she were alive. The content originally written by Rising remains valuable although researchers may need to discover resources current researchers use in place of some of those no longer available. This review is based on an advance electronic copy provided by the publisher through NetGalley with expectations of an honest review. Perkins, S. C. Murder Once Removed. New York: Minotaur Books, 2019. Lucy Lancaster, a professional genealogist, researches the family of Gus Halloran, uncovering a mystery surrounding the mid-19th century death of Seth Halloran. A photographer's journal states he was murdered by C.A. and then the scene was tampered to make it look as though he were trampled by horses. Lucy finds two candidates for C.A., but since enmity runs deep between the Applewhite and Halloran families, Gus focuses on that solution when he tells his family's story in a press conference. A page, possibly revealing the identity of C.A., was missing from the journal. As Lucy investigates, she runs into an FBI agent moonlighting as a history professor and into danger. I enjoyed the historic mystery; however, several things bothered me about the book. Lucy discusses research several times in very vague terms, making me wonder how familiar the author was with genealogical research. At one point Lucy tells another character about her flat rate package for researching "first family" Texas ancestry. Very few professional genealogists offer flat rate packages these days because it is nearly impossible to predict how long it will take to make a genealogically sound connection to a qualifying individual. Those who do offer such a package generally work for a larger firm rather than for themselves. Most charge an hourly rate plus expenses with a retainer collected up front. The balance is usually due before the final report is sent. The biggest error concerned census research. Lucy found results in the 1890 census. That census was mostly destroyed by fire. For the state in question, fragments of three enumeration districts in two counties exist as well as the Union Veterans schedule, which was small in a Confederate state. In the extent schedules, six families appear in one county; in the other county, four families appear in one enumeration district fragment and ninety-two families in the other district. Nowhere did Lucy mention the county to which the family moved and nowhere did she mention luck at finding the family. In fact the two counties were unlikely places for the family to reside based on comments about the family's life in the state. While widows of Union veterans were sometimes heads of household in these schedules, the information supposedly gleaned from the census makes it impossible the veterans schedule was what she consulted. While the mystery held great potential, the author's unfamiliarity with genealogical research hampered its effectiveness. If the series continues, I hope the author gets a professional genealogist to read the book to find errors in record availability and in practice. The other irritating flaw in the book was the author's unprofessional conduct in several instances. No instance's activity served to advance the plot in a way that could not be achieved through ethical means. The author needs to read Genealogy Standards by the Board for Certification of Genealogists and the Association of Professional Genealogist's Code of Ethics before writing additional installments. This review reflects the text appearing in an advance electronic copy provided by the publisher through NetGalley with the expectation of an honest review. Hawes, James. The Shortest History of Germany. New York: The Experiment, 2019. 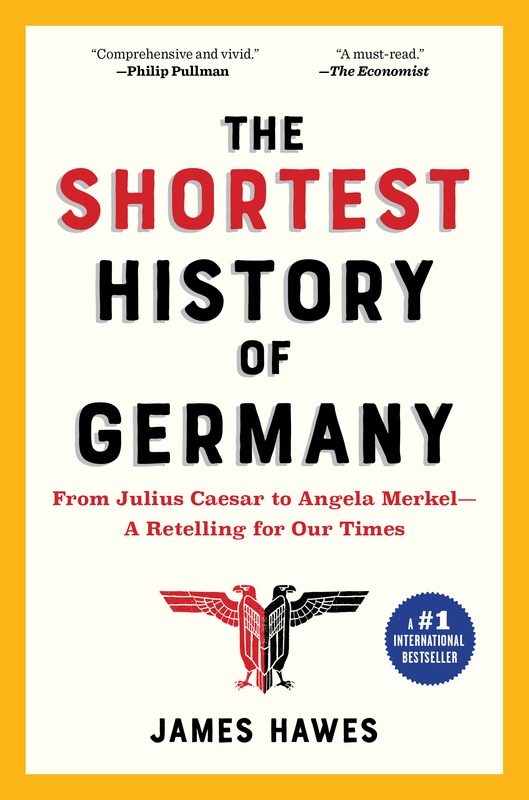 When I saw this book, I saw it as an opportunity to learn more about the history of Germany. Disappointment set in almost from the moment I opened the book. Non-existent documentation, an overly familiar writing style, and blatant political bias plagued the account. In a small book such as this, one expects superficial treatment; however, the author's biases seem to drive what he glosses over and what he treats more in-depth. The author needs to return to writing fiction and refrain from non-fiction unless he plans to document his work and ignore his own biases. I received an advance electronic copy through NetGalley with the expectation of an honest review. The book's index was not included in the version I read. Gates, Eva. Something Read, Something Dead. New York: Crooked Lane, 2019. The lighthouse has a crack threatening continuing library operations unless significant funds are raised. Josie's upcoming wedding brings in distant relatives from New Orleans who think she's way behind on her wedding planning and try to take over. When one of them shows up dead, Josie becomes a suspect. The state police send in their own detective since the local law enforcement know the main suspect too well. Officer Watson doesn't even try to dissuade Lucy from her investigation in his usual manner. The action takes place during winter when tourism is slow on the Outer Banks. 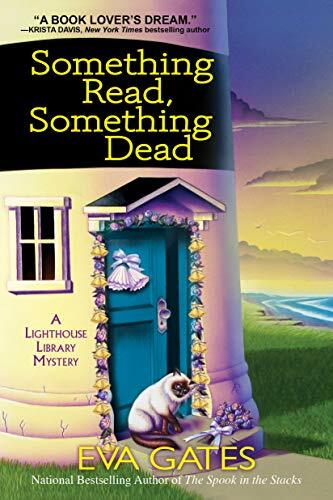 I figured this one out much earlier than Lucy did, but it didn't stop me from enjoying my trip to the Outer Banks with the enjoyable cast of characters, including Charlie the lighthouse cat. I received an advance electronic copy from the publisher through NetGalley in exchange for an honest review. Childs, Laura. Broken Bone China. New York: Berkley Prime Crime, 2019. Theodosia and Drayton witness a drone intentionally taking out a nearby hot air balloon as they soar above Charleston. The three person aboard were killed in the explosion. Then an employee of one of murdered men reports the theft of a valuable historic flag. Theodosia's detective boyfriend is attending a conference out of town most of the book. Tidwell is the main investigator. Needless to say, Theodosia does a little detecting. Readers always wish they could visit the tea shop on their trips to Charleston. I wanted to attend all the themed teas she did in this installment, especially the Nancy Drew one! It's a satisfying installment in a long-running series. I received an advance electronic copy from the publisher through NetGalley with the expecation of an honest review. 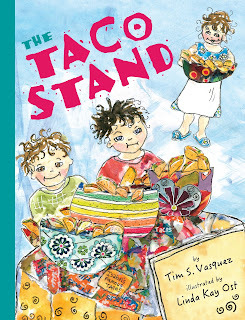 Vasquez, Tim S. The Taco Stand. Illustrated by Linda Kay Ost. Gilbert, Arizona: Toodaloo Publishing Company, 2019. Isabel enjoys preparing food for her family. She even makes extra tacos her children can sell to passers-by on the street. One day a man in a business suit visits the taco stand, making Isabel a business proposal. Will she take him up on the offer or choose to spend time with her family? I loved the message the book conveyed. Money cannot buy happiness. The illustrations were colorful, fitting the book. The book contains a glossary of Mexican food terms. I received an electronic copy from the publisher through NetGalley with the expectation of an honest review. Buziak, Cari. Whimsical Cross-Stitch: More than 130 Designs from Trendy to Traditional. Mineola, New York: Dover Publications, 2019. Most projects in this collection can be completed in a short amount of time. Many designs are similar to freebies found on various manufacturer, designer, and shop sites on the Internet. I found only a handful of patterns that interested me enough to stitch. The best audience for this may be a child just learning to stitch as several designs are quick to stitch, colorful, don't require a lot of fabric, and can provide a quick sense of accomplishment. For the nearly $20 purchase price, I will not be purchasing a copy for myself. Stitchers probably want to browse a copy in a bookstore or cross stitch shop before purchasing it to make sure it interests them enough. This review is based on an electronic copy provided by the publisher through NetGalley with expectations of an honest review. Appleby, Sue. 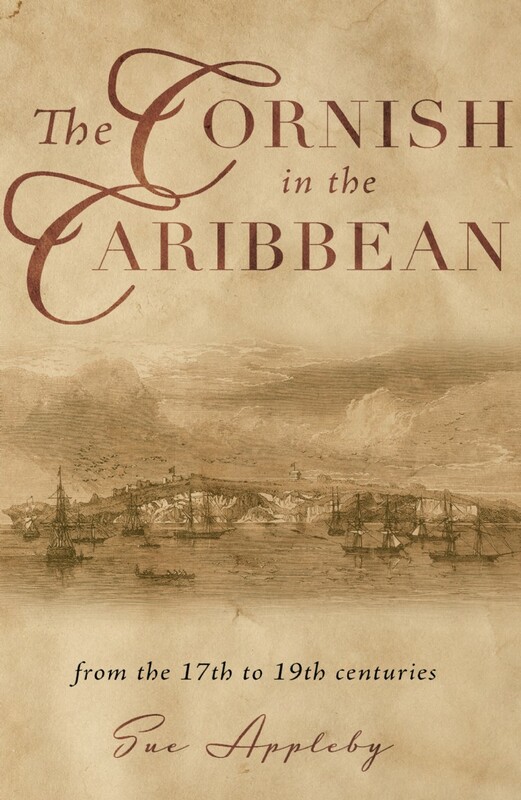 The Cornish in the Caribbean: From the 17th to the 19th Centuries. Kibworth Beauchamp, Leicestershire: Matador, 2019. This well-documented historical work focuses on the Cornish immigration to the Caribbean in the seventeenth to nineteenth centuries. Appleby provides insight into conditions drawing men to the islands. Mining became the chief occupation of those who settled. Because of Methodism's prevalence in Cornwall, missionaries populated the islands reaching out to the English and native inhabitants. The main text presents the lives of the men residing in the islands while the appendices provide brief histories of the islands and of Methodism's rise in Cornwall. With over 750 endnotes and an extensive bibliography, Appleby provides readers with resources for further research. I received an electronic copy from the publisher through NetGalley with expectations of an honest review. In the protected ePub version I downloaded, the illustrations were distorted. It was especially annoying with maps and elongated single portraits/sketches of individuals. I do not know if the problem extends to the Kindle version and certainly hope the problem was not in the print edition. Shapiro, Dani. Inheritance: A Memoir of Genealogy, Paternity, and Love. New York: Alfred A. Knopf, 2019. Dani Shapiro took a DNA test. The man she believed to be her biological father was not. She discovered her parents difficult conceiving a child led them to a clinic where her mother was artificially inseminated not with her father's sperm but with that of a young doctor. A first cousin match led to the man's identity. Correspondence between Shapiro and her biological father took place. The eventually met. While I enjoyed the DNA story, the publication of the memoir revealing the man's identity appears to be a violation of genetic genealogy ethics, particularly when she continually voiced the man's concern for privacy. I received an advance electronic copy of the book from the publisher through NetGalley in exchange for an honest review. I hope the final version includes her biological father's consent to be named. Symons, Julian. The Belting Inheritance. Scottsdale, Arizona: Poisoned Pen Press, 2019. A woman who bore four sons expects to die soon. Two of the sons were declared dead in the war. The other two live. A man claiming to be her son David shows up. Is he who he states he is? The woman believes he is. The two sons do not. Will the sons be able to prove he's an impostor before she dies--or will the alleged son inherit with a changed will? It's a pleasant way to spend a few hours. I either read this book previously or one with a very similar plot because the plot seemed familiar all the way along to the ending. I received an advance copy from the publisher through NetGalley with the expectation of an honest review. Tung, Debbie. Book Love. Kansas City, Missouri: Andrews McMeel, 2019. Cartoonist Debbie Tung's book will be adored by bibliophiles everywhere. It's not really a graphic novel. It's more of a collection of thoughts on books and reading with some of them serialized over several pages. It makes a perfect gift for the book lover. I received an electronic copy of the book from the publisher through NetGalley with the expectation of an honest review.